After graduating high school, James Rico decides to follow his friend into the Navy. He never really intended to join up, and although the only way to become a voting citizen is through the armed forces, he doesn’t really seem all that motivated by anything other than the fact that no one really believes him that he will. As it turns out, the Navy doesn’t want him but he is accepted into the Army’s Mobile Infantry by default. He almost never makes it out of boot camp and when he does, he finds himself in the middle of the galaxy-wide “Bug War” with an even worse chance of survival. For me, reading Starship Troopers was like a fan of vampire movies finally getting around to seeing Nosferatu and finding out where so many of the tropes that are now so common and loveable originally came from. I very recently read, Old Man’s War by John Scalzi; probably the most obvious descendant of ST. Had I known exactly how similar the two books were I probably would have waited to read OMW. That being said, I’m kind of glad I read them in the order I did. If I had read them in the other direction, I’m curious whether I would have thought of Scalzi’s as a rip-off. The thing is, OMW is so freaking good, it’s hard to care one way or another. And this is the case with a number of other Military SF that I could name off the top of my head. In the end, I think it might be like how every vampire movie borrows something from Interview with the Vampire and it probably says more about the quality of the original than anything about plagiarism. Starship Troopers is one of those books that, as they say, “started it all”. 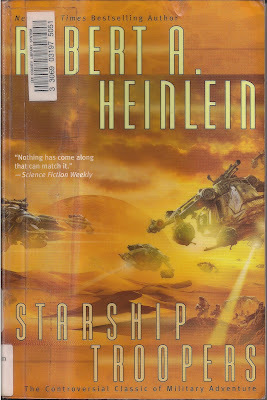 I wouldn’t say Heinlein wrote poorly, I’d just say ST falls a little flat. It’s difficult to understand what exactly is motivating Rico and as a result, it takes quite a long time before there is any reason to care about him at all. The prose is straightforward and bland and there’s none of the personality that I’m accustomed to from Heinlein, anywhere. It’s like someone went through and ripped out the crucial chapter and I was just left wondering, “okay, who cares?” We don’t actually get to know our main character very well at all and it’s a little difficult to separate Heinlein’s lectures from what Rico actually thinks so here we have a case of an author committing a crime against wordsmithery. He commits the crime of telling so egregiously that it actually confused me about where the main character stood. Not okay! And then there are The Bugs. They are “The Other” straight out of any war propaganda, and other than learning a little of their physiology, we don’t really know where they come from, what they are doing or where they fit in the universe and neither does anyone in the book, try as they might. I’ll admit, this could be an opportunity for greatness, but how does humanity respond? Terror. They are physically unable to associate in any way with the actual thinking members of Bug society and even hardened army vets are terrified just at the sight of them. In the end there was no reflection whatsoever about the Bugs or humanity’s approach to them. Bummer. It’s funny; the cover of my book claims ST is the “Controversial military classic”. Having read some of his others I was pretty curious and excited. What I experienced was just more flatness. Okay, I understand people don’t often appreciate their freedom, people don’t often work for it or understand what it takes to maintain it, but what Heinlein has created is some kind of pseudo caste system. Instead he glorifies military service and vastly undervalues the role and importance of all kinds of public service which doesn’t involve killing. And I think we all know what happens when you force people to appreciate anything, they stop caring anyway! C’mon! This was really disappointing and such a puerile idea that I’m not sure what was so controversial. The fact that he wasn’t even able to convey this little bit half-thought out philosophical muck without just straight-up lecturing his readers is just the nasty cherry on top of this mediocre sundae. And since were on the subject of weak sauce. You may remember I ended the 1950’s with a request of the 1960’s winners to step up their game and include some women at all. Well Heinlein did, in typical Heinlein fashion. What he sees as inherent differences between men and women are over-emphasized and of course women are highly and mostly sexualized. He does this thing where women in his novels are the only people who can perform certain, highly specialized and necessary jobs which seems like an expression of respect but also seems like just another way of objectifying them. I’ve stood up for Heinlein’s women in the past because there are some who are just so cool but ST makes it hard to keep defending him. Erg. If I had to characterize my appreciation for Heinlein I’d say I was in the Waxing Gibbous phase as I began this blog (maybe actually full moon after The Moon is a Harsh Mistress, but that’s coming later). With a little more SF under my belt I think it may be safe to say that I’m entering the Waning Gibbous or even just Third Quarter phase (Yay random moon phase analogy). I think ST might represent his most limp philosophizing, hollow characterization and his most weak sauce…ever. Starship Troopers was fun but if I’m in the mood for military SF, I’m going somewhere else. This week’s book is …And Call Me Conrad (This Immortal) by Roger Zelazny. Next week’s book is Dune by Frank Herbert. This will also be my second re-read of the project. I agree. I always felt this book should have been longer to fully explain what was going on. Also adding the other wars with other different (Not bug) planets made me disappointed in Humans in general. We never seemed to be able to do anything through open dialogue and diplomacy. Just use the nukes!!! Another note: I always imagined this as Heinlein's way of showing what would happen if the world was ruled by a Nazi type regime. 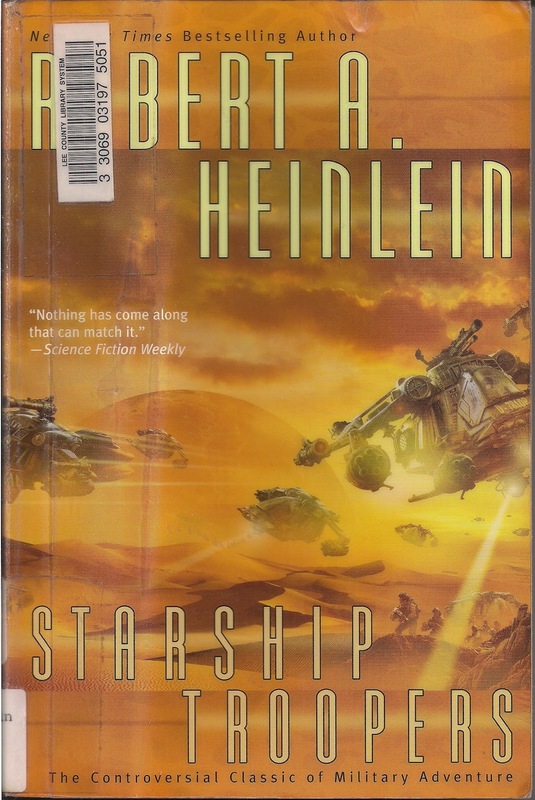 This book was one that Heinlein should have worked harder on and I actually like the movie better. Oh wow! I haven't seen the movie but I've not heard very good things. Now I want to see it. It sounds like you would like Old Man's War. It's a movie that you love or hate. The actors are not very good, but I always liked it for some reason. The actually a sequel but that is not worth watching. I do also want to note that I read this book a long time ago and was going off of memory. Sorry should reread but just have to much going on with the worm farm. That's all fine, I'll probably get around to watching it eventually out of curiosity if nothing else. To the everlasting glory of the infantry! Of course, the movie has nothing in common with the book, except for some character, and the oath. I find much more resemblance between the movie and John Steakley's "Armor", particularly the action scenes. Agreed! Heinlein could have done more with this book, as I believe he did with "The Moon is a Harsh Mistress", soon to be read in my quest to complete all Hugo winners. Anyway, I don't think you've read too much into it at all. I agree about your judgement of Heinlein but for me, I didn't feel he had created a viable/believable threat in the Bugs. Sure they can be compared to communists, but other than that they are a lot like ants, what do we really know about them? Not much of anything at all. They are threatening and we need to kill them because we don't even know what they want and I just felt that I couldn't even identify with the threat. Some of my most guilty pleasures are military SF so I was really excited about this one. For some reason though, I could never really get into those "rites of passage" but I guess you're right, he did make a lot of mistakes and was pretty unsure of himself, especially toward the end. That's not something you see very often and I probably didn't recognize that well enough...dang. I don't normally like to judge a book by what I thought could have been added but I thought the message was so similar to TMHM and it was done so much more...haphazardly (or something?) it made it feel like half a book or something in comparison. Seriously, it's just one of those that I for some reason or another never got round to reading. In the past I also enjoyed escaping with Weber's Honor Harrington books, but got bored with the series, and also devoured Moon's Familias Regnant series. The Vorkosigan saga is exceptional. I think they are all Troopers' legacy. It seems we have a lot of interests in common. I think you'll enjoy TMHM immensely. It's kind of funny. I feel the same way, yet at least for a time I enjoyed playing first person shooters and I love military SF. I remember my grandfather being kind of disgusted once when I was playing a game saying that if I ever set foot in a battle (he was in WWII) I would be cured of "that". I felt really bad and didn't really know how to explain what it was to me in any way that would satisfy him. Probably one of those interactions I'll never forget with him. It was kind of sad, wondering what he might have thought of me and I wasn't able to explain. Some of those titles I'll be reading for HEP, others I've already read and the rest are now on the TBR list. Thanks! I think my biggest problem with this book was the interminable amount of time spent describing military ranks and roles, which really added nothing to the story. I got so bored by those sections that they're all I remember. After reading a couple of later military SF that were very clearly inspired by Starship Troopers, I at least have a greater respect for the role it has in the history of SF, namely, that it was very significant. Still, I tend to enjoy those other stories inspired by this one more... I guess I'm kind of with you in that I felt a little bored while reading it, though I don't recall having a problem with the same issue. It's funny what we remember years after having read a book. And yeah, I'm definitely with you in respecting the book for it's significance. I absolutely loved Old Man's War and a few other military sci-fi novels, and seeing where they came from really puts them into perspective.